between JoJo's Bizarre Adventure: Golden Wind and glamb! 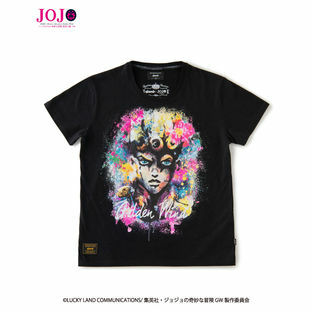 This features art on T-shirts inspired by the six members of the Passione. Size options available include five sizes all the way from (XS) to (XL). In the previous collaboration, products were released with art of the protagonist Jotaro drawn in spray paint art. Meanwhile, his archenemy DIO was aggressively drawn in action painting. 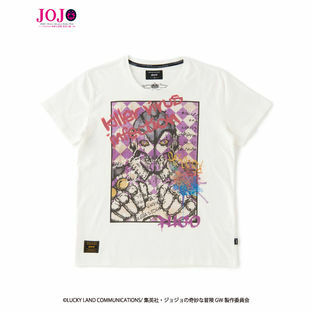 This particular work was designed based upon the fact that Giorno Giovanna, the protagonist of Golden Wind, shares blood ties with both the Joestar Family and DIO. In order to represent those ties, this version was drawn using a mix of two different methods. Watercolors were used to extend flowers through the background to express Giorno’s Stand, Golden Wind. 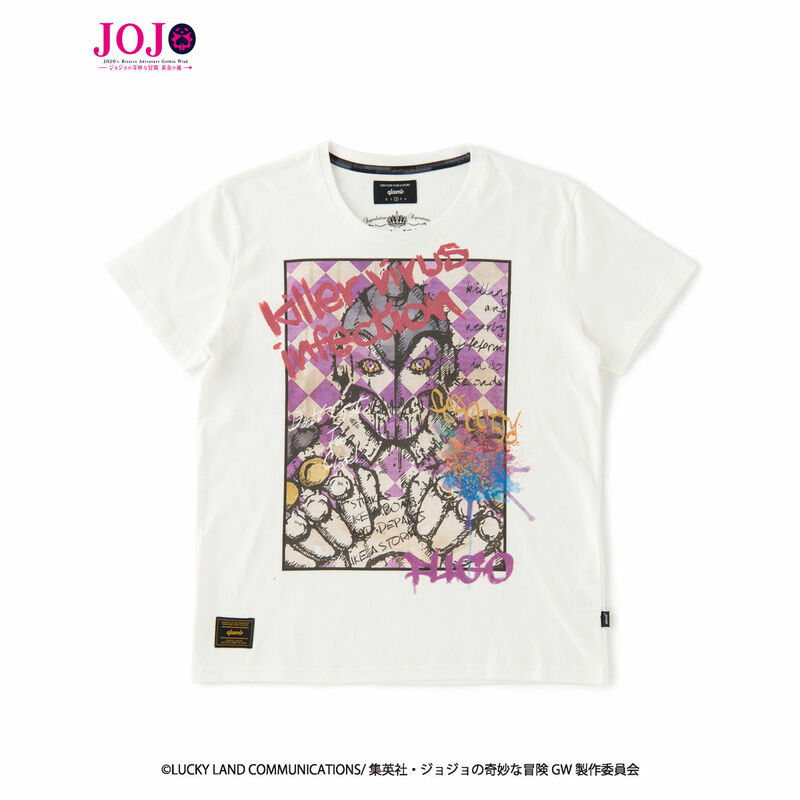 As a finishing touch to this 40/2 T-cloth, the shirt is signed with the subtitle Golden Wind to complete this elegant, vibrant and animated portrait. 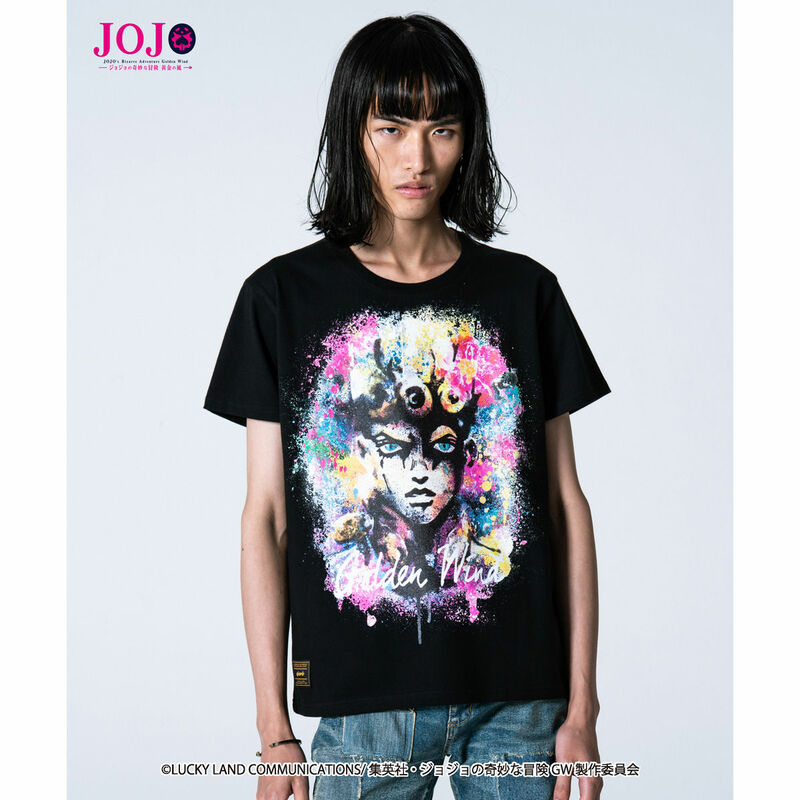 Bruno Bucciarati, leader of the gang that protagonist Giorno belongs to. 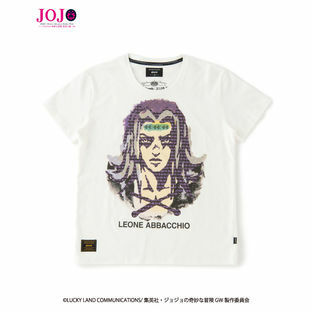 The base design, out of a desire to faithfully express Bucciarati’s sense of righteousness, was inspired by the drawings and art from vintage American comics and movie T-shirts. From those inspirations, a strong image of what a hero is and should be was created and rendered for this T-shirt. On the right side looking from the front, Bucciarati’s signature phrase “Arrivederci” (“Goodbye” in Italian) is weaved on to further enhance the positive image of victory. 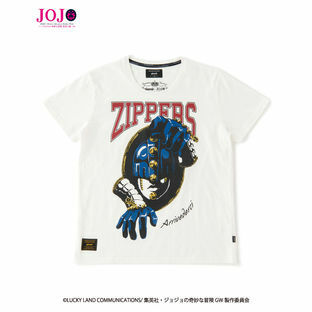 Combined with the textile feel of the 40/2 T-cloth, this T-shirt will surely make anyone feel great. Leone Abbacchio, a perpetually cool and calm expert Stand User. His Stand, Moody Jazz, has a distinct digital timer on its forehead. In order to express this enigmatic character, mixed media art was used to create the image for this T-shirt. Blended together with the digital motif of the art is a tinge of somberness in the character’s expression, which attracts and locks onto the eyes of people who gaze upon it. This supple cotton shirt is the very manifestation of graphical modern art. 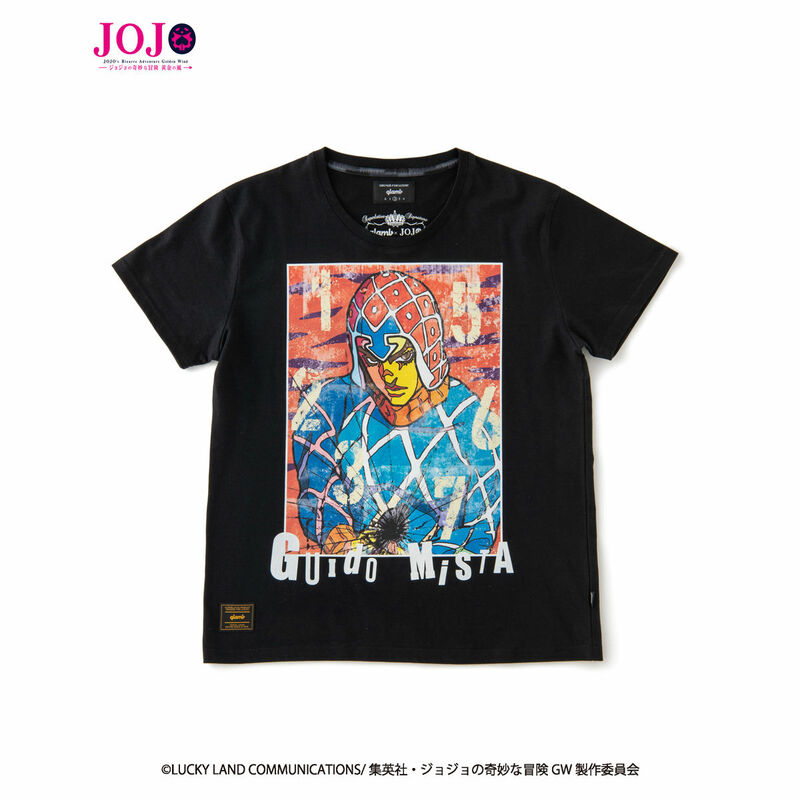 Guido Mista, the resident comical mood maker with a resolute will. A vigorous composition contains his direct, straightforward character, drawn via inspiration from trendy murals. His Stand, composed of six entities, represent the numbers 1 through 7 with the exception of the number 4. In addition, this work is drawn to appear as if it was ripped apart by a bullet. Leaving behind a cloth texture reminiscent of grazed bullet holes, this expresses the abilities of Mista’s Stand. The artistic medium selected for the manifestation of this graphical conception is 40/2 T-cloth. Looks good and feels good to wear: that describes this perfect street style fashion shirt to a T.
Delivered here is a graphically vivid work with a motif based on Narancia Ghirga’s battle-oriented Stand, Li’l Bomber. 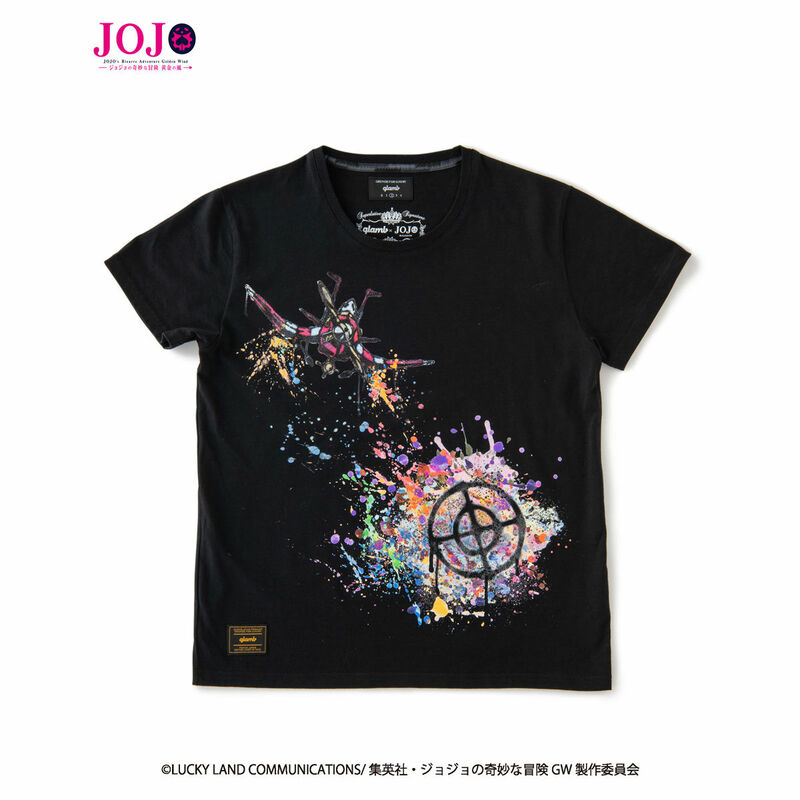 The sight of his Stand going wild and vigorously firing off bullets is depicted via colorful dripping art. The great finesse brings out Narancia's energetic character. The orange colors scattered around the muzzles represent what Narancia means in Italian: “orange”. Orange is also the thematic color that adorned Narancia in the original works. Enjoy the smooth and supple feel of this shirt that greatly resembles fine street art. Pannacotta Fugo, master Stand User, has a Stand called Purple Smoke that precisely embodies his inner ferocious side. The distinct trait of a purple check pattern is merged into the background with a psychedelic rock style, brought together in a single piece of art. The text scribbled across this work are all words that were used to describe Pannacotta Fugo in the source material. Depicted above his left fist is the poisonous content of a broken capsule. The design of this shirt is based on raw, wild motifs like in skater and punk culture, but the actual feel of this supple 40/2 T-cloth shirt is very comfortable.